Have motorcycle gear you’re no longer using? Here’s your chance to clean out the closet. In the car parking lot by the pedestrian bridge. 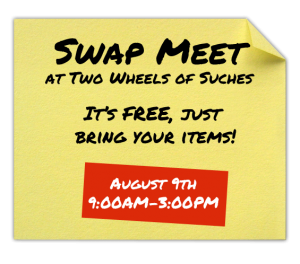 It’s FREE just bring your stuff and setup for selling or trading. It’s your deal. We’re providing the great venue. We hope to see you … tell your friends.